CITIES: This area includes the following surrounding cities/towns/communities. Note, Rio Medina is located just SE of this area in the low flatlands, and is not within the Texas Hill Country. MEDINA LAKE: This lake is the focal point of the area. 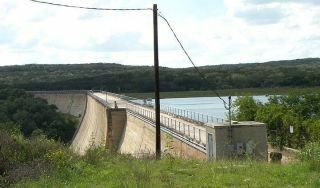 The lake is an artificial (man-made) reservoir on the Medina River, and its center is 8 mi NW of the Medina River in SE Bandera and NE Medina counties. This lake was constructed to irrigate farmlands in Medina, Bexar, and Atascosa counties, but it also became an important recreational facility. A diversion dam and reservoir 4 mi below the main dam eliminated the need for 4 mi of canal work. This smaller dam covers 400 acres. The entire irrigation system was designed to operate by gravity (without the use of pumps). Lake Shape: crescent-shaped reservoir running W to E, 18 mi long and 3 mi wide at its broadest point. Update at May 30, 2016: The lake is full, and even overflowing at times! Update at June 1, 2015: With the recent very heavy rains, the lake basin is filling again. Update at Jan 18, 2015: As part of the ongoing drought, the Medina Lake is only a few percent full. Many businesses have closed in the area, many residents have left and Lakehills has become somewhat of a ghost town. HISTORY: Handbook of Texas Online: MEDINA LAKE. Medina Lake, an artificial lake on the Medina River, is eight miles northwest of the Medina River in southeast Bandera and northeast Medina counties (its center is at 29°32' N, 98°56' W). The lake was constructed to irrigate farmlands in Medina, Bexar, and Atascosa counties, but it also became an important recreational facility in the area. Henri Castro explored the Medina River Valley in the 1840s and saw that its deep canyons could be used to irrigate farmlands to the south if water that periodically flooded the canyons could be contained. Castro's observation went unnoticed until the end of the nineteenth century. In 1894 Alex Y. Walton, Jr., a civil engineer from San Antonio, became excited by the possibility of impounding the Medina's floodwaters and discussed the idea with Terrell Bartlett and Willis Ranney, also civil engineers from San Antonio. The three could not raise the necessary funds for building a dam until 1910, when they were put in touch with Frederick Stark Pearson, an engineer who had been involved in power projects in North and South America and had the confidence of investors. Pearson successfully raised $6 million to finance the Medina dam and irrigation project through the sale of bonds to British subscribers. On August 19, 1910, the Medina Irrigation Company paid $149,200 for land to be placed under irrigation. Offices of the company had been established in San Antonio. Bartlett, Ranney, Walton, Thomas B. Palfrey, and Duval West, all of San Antonio, filed on August 19, 1910, for the appropriation of the waters of the Medina River for irrigation in Medina, Bandera, Kerr, and Kendall counties. The amount of land to be irrigated was estimated to be 150,000 acres. In the spring of 1911 the Southern Pacific Railroad laid track from Dunlay to the site of the main dam, fourteen miles north of Castroville. The railroad and improvements in roads from San Antonio, Castroville, and the Medina River to the dam site made it possible for work on the dam to begin in November of that year. The dam was completed in November 1912. At the time, it was the largest dam in Texas and the fourth largest in the United States. It forms a reservoir of 5,575 acres at spillway level and 6,260 acres at flood stage and impounds 254,000 acre-feet of water at spillway level. The lake has a shoreline of 100 miles. The maximum depth of water at the dam is 152 feet, and the average depth of the lake at spillway level is seventy-five feet. A diversion dam and reservoir four miles below the main dam eliminated the need for four miles of canal work. This smaller dam covers 400 acres. The entire irrigation system was designed to operate by gravity, without the use of pumps. World War I cut off access to British capital, and the Medina Irrigation Company was placed in receivership in 1914. Under the receivership no land in the project was sold; it was instead leased to farmers who bought irrigation water for their crops. After the war, bondholders in the receivership organized in London and began an effort to sell the Medina Irrigation Company. The sale did not occur until 1927, when the newly formed San Antonio Suburban Irrigated Farms bought the company. However, this company soon had financial difficulties and was placed in receivership in 1930. The next owner, Medina Irrigated Farms, was sold on November 22, 1950. The dam is now operated by Water Improvement District No. 1. The lake continues to serve as a source of irrigation and municipal water, as well as a recreation center. See HTO listings for each town located here. WALLYS WATERSPORTS: 210-859-5246; 7162 CR-271, Mico, TX 78056. www.wallyswatersports.com. Boat storage, ski instruction, kayak rentals, pro shop. Note, there are no US Post Offices in the immediate area. See Bandera. (THE) OVERLOOK EVENT CENTER: 830-751-3868; 169 Private Road 1710, Mico TX 78056. www.theoverlookeventcenter.com. 4 overnight luxury suites among other facilities at this event center. See more below. (THE) OVERLOOK EVENT CENTER: 830-751-3868; 169 Private Road 1710, Mico TX 78056. www.theoverlookeventcenter.com. Large meeting facility, plus bar, fitness center, pool, hot tub, pavilion and luxury suites. LAKEHILLS CIVIC CENTER: 830-751-9904; 210-379-4142, Lakehills, TX 78063. Bandera County's largest rental hall. LAKE MEDINA CONSERVATION SOCIETY & MEDINA RIVER PROTECTION FUND: 210-387-3923; 2272 Mountain Dr, Lakehills, TX 78063. www.medinariver.net. Lake Medina Conservation Society (LAMCOS) serves the interests of Medina Lake and surrounding environs. Non-profit incorporated organization dedicated to protecting Medina Lake and water resources in Bandera County. MEDINA RIVER PROTECTION FUND: 210-387-3923; POB 417, 2272 Mountain Dr, Lakehills, TX 78063. www.medinariver.net. Medina River Cleanup, annual river cleanup, foster conservation of the river. We clean up approx. 50 miles of the Medina River each year the first Saturday in May. Mission: The efforts to save Medina Lake don't end with a flood that fills the lake. Our goal is to ensure effective stewardship of the water in the lake to the benefit of the farmers, ranchers, recreational users, area businesses, and surrounding counties. Note: Churches are listed on this page in a separate category. MEDINA HIGHLANDS PARK: 830-282-1170; 560 Mountain Dr, Lakehills, TX 78063. www.medina-highlands.com. RV park, full hook-ups.